In Brazil, the Biblical mountains are of great importance to Christians. Climbing a mountain represents a place of retreat and it is common for groups of Christians to climb to the top of a mountain to thank God, make personal requests about financial resources, business spirituality, offer sacrifices, consecrate objects or witness a supernatural manifestation. The Bible, however, shows that Jesus went to a mountain, not because it was a spiritually special place, but to escape the crowd that surrounded him. Every time Jesus went up to a mountain he spoke to God and sought His presence, not simply to seek power. Power is the result of a consequential search for God. Upon my arrival to Cairo, the start of my visit for personal and professional knowledge, there was an opportunity to take a trip through the Sinai Peninsula, Sharm El-Shaykh, the Dahab region and some Red Sea beaches until we arrived at the mountain that lies between Egypt and Palestine, also known as Mount Horeb in the Biblical passages. The place called the "mountain of God" is the summit on which Moses ascended and received the law. God revealed Himself to Moses and established an alliance with the people of Israel as a nation (Exodus 19:20, 24:18). This mountain has a significant representation for us Christians as well as Jews, Muslims, and non-religious people. I believe that the importance of Mount Sinai, the modern name for Mount Horeb, is also due to the fact that it was Moses who led the people of Israel during the Exodus. The Hebrew name Mosheh means "taken out" or in Egyptian origin, perhaps derived from Mose, which means "is born." The story of Moses' birth is well known. All that is known of his childhood is that he was "instructed in all the knowledge of the Egyptians" (Acts 7:22). In adulthood, Pharaoh learned that Moses had killed an Egyptian to defend a Hebrew, and sought to kill him, but Moses fled to the wilderness of Sinai and settled in Midian. Once, when he was feeding his father-in-law's flock, God led him to walk to the western side of the desert toward the hills. This path leads to the peak of Mount Sinai, also known today as the "Sikket Saydna Musa," which means in Arabic, "the Way of Moses." This is also the way visitors and pilgrims travel. At the top of the hill, God revealed Himself in a burning bush, that is, a bush that burned but was not consumed by the fire. This was the call to lead the people of Israel in their deliverance from Egypt. We were a group of young people formed by Egyptians, Kenyans and Brazilians, with different beliefs, ages, expectations, history, dreams and most of them medical students. I, as a student of psychology, am always attentive to actions, speeches, and reactions to extreme situations, which I find incredibly beneficial in the process of providing help for others. As a student of theology, faith is sufficient for this moment, for one thing is certain: Moses, even with the limited resources his time provided, established his faith in Him who is the owner of all wisdom and power. Having reached the base of the mountain, we could not see a way to continue, the granite peak that is 2,285 meters above sea level is difficult to see. We prepared ourselves through reading about Biblical history and culture. In our bag pack we took our first aid kit, skin and lip protectors, medicines, food and also things that would contribute to facing the -5C cold such as many pieces of clothing, blankets, gloves, and many socks. You cannot forget the water to hydrate us during the climb, since the trail path extends between 6 and 7 km and over 750 steps, lasting on average from 3 to 5 hours the mountain above. The path alternates between the warmth of clothes and the frigidity of the environment, the cold sweat due to the decrease of oxygen and the gasping for breath due to fatigue. Along the way I realized that our actions led us to learn the Biblical commandments. At first the group's focus was on taking beautiful photos, selfies and videos from the top of the mountain, keeping the cell phone on and with battery to record every second. We had enough qualitative electronic gadgets to show the blue sky and starring from various angles. We were speeding to arrive in time for the right moment to capture the view of sunrise made in gradient with shades of yellow, orange and blue. The Old Testament records a jealous God who demands exclusivity from his people. We see clearly this requirement in the First Commandment: "Thou shalt have no other gods besides me" (Exodus 20: 3). When we speak of idolatry, we mean deifying things, placing them above God. The Second Commandment: "You shall not make for yourself an idol in anything in heaven, on earth or in the waters under the earth (Exodus 20: 4)." At that moment, the craving for perfect record was certainly more important than contemplating the magnitude of the creative God. We were in one of the most important places in the world for their geographical references are part of Divine Revelation to humanity. The Third Commandment: "Thou shalt not take in vain the name of the Lord your God, for the Lord will not go unpunished who takes His name in vain” (Exodus 20: 7). God rewards those who give their life for Him and love Him.Living for God takes seriousness and this, Saint Catherine clearly teaches us. The view is surreal! A masterful combination of rocky mountains, a clean, deep blue sky and many stars as close as we have ever seen before. The stars shone, illuminating the way that my distracted eyes gazed up at the heavens. The feeling was only of gratitude to God for this favor. The Fourth Commandment: "Remember the sabbath day, to keep it holy: you shall work for six days, and do all your work in them, but the seventh day is the sabbath of the LORD thy God: on that day thou shalt do no work, neither thou nor thine sons or daughters, or your servants or servants, nor your animals, nor the foreigners who dwell in your cities (Exodus 20: 8-10)." Routine overshadows such a feeling. The multitasking to be performed during the day does not allow us to take a moment to be grateful, God invites us to dedicate a portion of our time to thank all the countless blessings. Soon the curves began to appear on the hill, the double paths. The direction began to change, our vision began to darken, the lanterns had to be lit, our eyes always more attentive to the ground. When the steep climbs appeared the guides were forced to take their respective steps at the front of the group because they knew the way. The Fifth Commandment: "Honor your father and your mother, so that you may live long in the land which the Lord thy God giveth thee” (Exodus 20: 12). Most of the time we lost was by neglecting the instructions given to us. Our parents are like the guides ahead to enlighten our minds and find the best path on earth. During the climb, tired and frozen, we spotted small coffee and tea huts with lights high on the dark mountain. The play of lights animated our walk. We used challenges to keep up with the climb, and for seven times these seven coffee shops turned our arrival goals. We made it to the top. Some gave up halfway, others forgot the others and went alone to the top, others were overcome by altitude, cold or winds. The Sixth Commandment: "Thou shalt not kill” (Exodus 20: 13). This commandment forbids us to take our lives unjustly. Just as in life there are moments of mourning, tiredness, depression, illnesses and countless situations that lead us to act in a sinful way like taking one's life or even one's own. The Bible is very clear in forbidding us from reckless deeds. For all who continue will be recognized for their courage, freedom, self-expression, motivation, dreams, and purposes. After seven km climbing the trail, we found a staircase that scared us by the number of 750 steps. Especially for this ascent it is necessary to have control of our emotions, not to be overcome by obstacles, to align expectations with the group and the guides as not to lose hope, develop a balanced mind, a healthy body with practice of physical activities, consume nutritious food, good rest and relaxation. The Seventh Commandment: "Do not commit adultery” (Exodus 20: 14). Our body needs care when it is exposed to extreme, correct integration of its sexuality, purity of body and soul. There was a group of people who came up three hours before us and who were ecstatic and worried to record every moment. As for me, I only worried about "unfreezing" my hands and feet. I looked for a place where I could sit to enjoy the scenery I found, but due to the number of people in that place such luxury only lasted for five minutes. And once again I was led to reflect on the value of things. The Eighth Commandment: "Thou shalt not steal" (Exodus 20:15). Prohibits the appropriation of a space, something and time that is not yours. The media and exhibitionism have taken the place of good times to the point of displeasing those who are at your side. The few minutes of my privileged view, in my safe and secret place, I could contemplate what would have some resemblance to paradise, the true expression of nature. The incredible moment when the sun appears on the horizon, every day in all regions with sublime autonomy, was overshadowed by people, in the autonomous nature, no distraction is allowed. Several times I wanted to expel those who were there, because the fleeting beauty of the east and west requires concentration and we respond to this requirement by noting every detail through the eyes. The Ninth Commandment: "You shall not give false testimony against your neighbor” (Exodus 20: 16) is a clear example of the divine concern with the misrepresentation of the human being's ability to communicate, more specifically speaking. One of the purposes of the various commandments throughout the Bible were revealed to the people to "live in peace in society." This commandment aims at unity and, above all, mutual respect. The descent was light. Now we have a rich baggage of memories of this graceful experience. The grace of experiencing the splendorous nature revealed by the Creator filled the hearts of all who were present. I'm sorry to say that it's not all roses. As we contemplate the Good, we see evil. Perhaps this is the worst of human tasks, to contemplate the Good being inhabited by evil. Distressing is the reminder that I carry from a local worker. After denouncing the tourist police, a local worker was fired on charges of harassment. The Tenth Commandment seeks to protect mankind from the consequences of evil on man, "Thou shalt not covet thy neighbor's house: thou shalt not covet thy neighbor's wife, nor his servants or maid-servants, nor his ox or donkey, nor any thing that is his (Exodus 20:17)." Greed has been generating destruction since the earliest days. The lack of respect for the other and its properties disintegrates and hurts people. The policemen assigned to our group attempted to soften the burden of shame by their countryman's despicable actions. He guaranteed us a visit to the Monastery where we obtained a stone from Moses. On this stone I will record the Ten Commandments learned in practice that day. 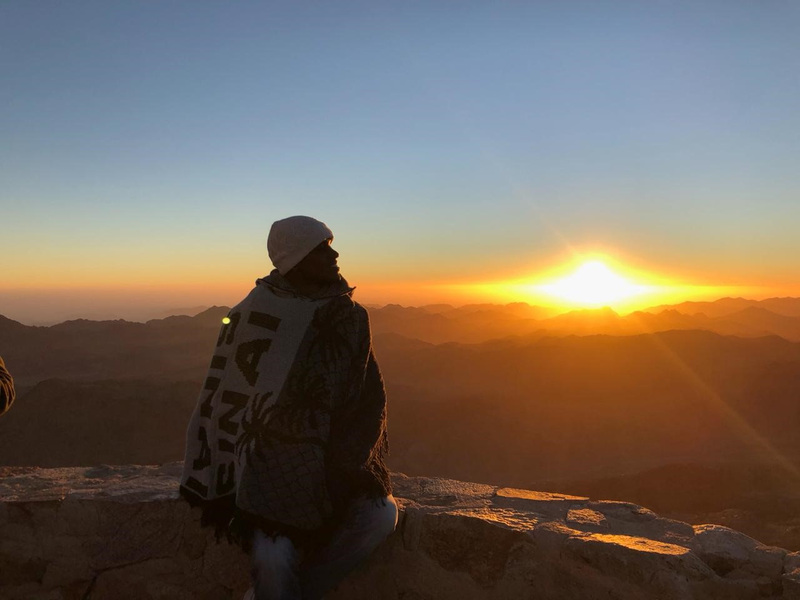 The Sinai is an incredible experience. The scenery cannot be felt, the tact is not useful. The comings and goings of the sun are silent, hearing does not aid in contemplation. And speaking, I do not know words that give vent to the experience on that mountain. It requires the psychological result of being resilient, which means: learning to move forward and recover when needed or on how many people grow stronger when they focus on spirituality, but there is no sure way to get in touch with our spiritual side. In the simplicity of every detail, to see the gracious work of the Creator and to realize that it is revealed in Him, is something that only spirituality gives us. Intern at the Center for Arab-West Understanding between Dec. 24, 2018 and Feb. 4, 2019.